Antarctica has to be one of the ultimate bucket list destinations and those lucky enough to visit the white continent such as myself are truly blessed. This diverse, unforgiving and mesmerizing chunk of land in the southern hemisphere is like nowhere else in the world – penguins gather in their thousands in immense colonies, icebergs as large as houses float through the freezing cold Antarctic waters, and there are snow and ice as far as the eye can see – it is magical. Most Antarctic adventures start from either Ushuaia in Argentina or New Zealand. I set off from Ushuaia and took the dreaded two-day boat crossing from the southern tip of South America, across the notorious Drake’s Passage, eventually landing in the Antarctic Peninsula – the experiences and memories I had here will last a lifetime, and I also managed to take some superb photographs. If you are planning a trip to Antarctica, and you want to take some fantastic photos, you must prepare. Taking photos in Antarctica (or any extreme cold climate for that matter) requires special care and attention and this guide will help you on your way – enjoy! The Ultimate Antarctic Photography Guide: All Photos in this post are taken by the author Paul Skidmore. See more about his expedition to the Antarctic on his blog: HaveYouPackedtheCamera.com. When traveling to Antarctica, it is vital that you take care of your equipment and protect your camera and accessories. The temperatures of the white continent can be deadly, and the weather can suddenly change in an instant; therefore, you must be prepared and have the correct equipment with you. The essential camera equipment is nothing out of the ordinary – as with any trip or photo shoot you should take your DSLR, and a wide range of lenses. The batteries and memory cards are vital – batteries can freeze or run flat in a matter of minutes depending on the temperatures; therefore, you must always carry three or more to be sure. Furthermore, you need several memory cards to ensure that you have redundancy and that you don’t save all your photos on one single card. In the event of an accident, if you have spread your photos over three cards, you will at least have some to take home with you. Be prepared for temperatures around -10°C and lower. Make sure to get the right clothing for your Antarctica trip! I won’t go into a full clothing breakdown here – there are plenty of articles available on the web for that, but the gloves are hugely important. I had a couple of pairs of gloves, and neither were suitable – my camera has a touch screen to focus therefore I had to take my gloves off in the extreme cold to take photos – don’t make the mistake that I did! Now that you have an idea of what equipment you should take on your Antarctic expedition, it is essential to understand how to use that equipment and how to deal with the varied climate and often harsh conditions. The weather does change depending on many factors and also, of course, the time of year you visit. I traveled to Antarctica in November. During some days such as our landing at Neko Harbor, the weather was fantastic – the sun was out, and the temperatures were excellent. I can remember hiking up the side of a mountain to view the spectacular natural bay and having to strip down to my trousers and thermal top. However during other days the snow lashed down on my face, the winds bit into my skin and visibility was poor – it was that changeable. To that end, you must have in mind your camera settings beforehand, and understand how to deal with the weather. If you consider the above advice, then you should be able to protect your camera and ensure that you can take photos throughout your time in Antarctica. Exposure is possibly the most important camera settings in Antarctica. As you can imagine, in Antarctica there is a heap of snow and white landscapes. You have to lower your default exposure to compensate for this brightness manually otherwise all of your photos are going to be washed out. This problem is even more evident when the sun is shining and reflecting on the snow. 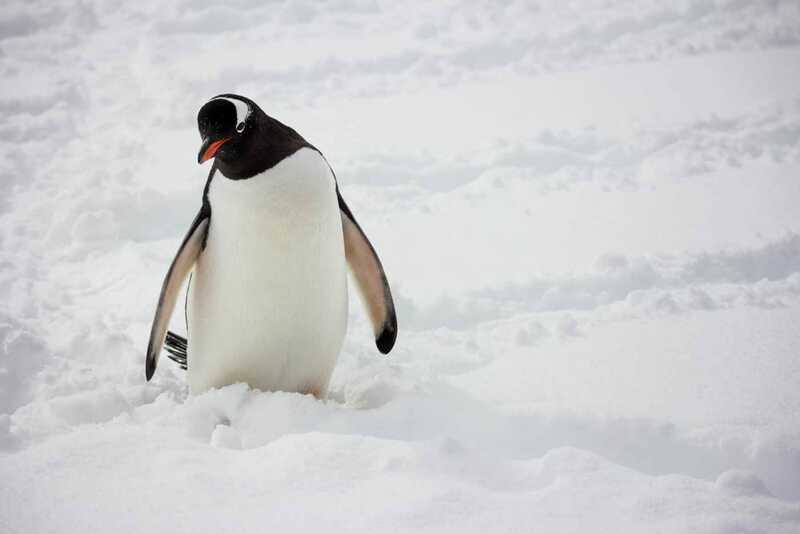 Antarctic Photography Tip: Lowering the exposure for a few stops will assure your images don’t end up overexposed. By lowering your exposure by two to three stops, you can counterbalance the brightness of the snow – if your photos turn out too dark, you can always increase the exposure and highlights in post-processing afterward. Antarctica allows you to experiment and unleash your creative genius. There is something amazing waiting for you at each new encounter. Every time you step foot out of the zodiac boat, there is a new opportunity or some fascinating new landscape to capture. Although the wildlife of Antarctica is impressive, I found myself in constant awe of the landscapes. The enormity, the tranquillity, the beauty and the scale of this continent is just breathtaking. I enjoyed taking landscape photos and trying to capture the serene beauty of this untouched part of the world. When taking photos on your Antarctica Expedition look for the reflections in the sea. As you can see from the photos I have taken, I have tried to use objects such as the zodiac boats to show the scale of the ice-shelves or the expedition boat to show the size of the bay and icebergs. Furthermore, as the sea is usually a deep blue, and the landscapes are white, you can produce some fantastic reflection shots from the water. Finally, always try and look for contrast – due to the vast amount of snow, landscape shots in Antarctica can sometimes be bland therefore the sky, sea and rocks can provide a welcome focal point. Antarctica is teeming with wildlife. If you visit during the right seasons, then you are going to be treated to a spectacle of nature. Colonies of Gentoo and Chinstrap penguins spread as far as the eye can see. Huge birds, such as Petrels, Skua’s and Albatross patrol the skies. You can see Whales, Leopards, Weddell Seals and even Orcas in the waters – you won’t know where to look! Taking wildlife photos in Antarctica is such a rewarding experience! My main tip is to invest in a decent zoom lens! For the most part, you may not be able to get extremely close to the wildlife. You can get close to the penguins, but you must always observe them from a respectable distance. Therefore, a zoom lens is going to help you capture distant details. Look for movements as opposed to just static poses. Be it wildlife, people or ships. Fast shutter speeds are a must, especially when taking photos of birds or wildlife swimming in the waters – you must have a fast shutter speed to capture their movement without motion blur. Also, try and take a mix of individual portrait style shots (of single penguins for example), together with group shots (such as penguin colonies or flocks of birds) – this helps show close-up detail, but also the animal’s natural habitat and behavior. For me, backing up my photos was the most important tip – I was lucky to visit Antarctica once, what would be the chances of me visiting again? At the end of each day, I used the public computer on the ship to transfer my photos onto an external HDD – this ensured that if my camera broke or I lost my cards, that I still had a backup and my once in a lifetime photos were safe. Finally, although taking photographs during your exploration in Antarctica will prove endless fun, please remember to enjoy the experience. Take time to put your camera away and immerse yourself in the glory and majesty of the Antarctic landscape – take the polar plunge, get to know your fellow expeditionary; enjoy the moment and make some brilliant memories!